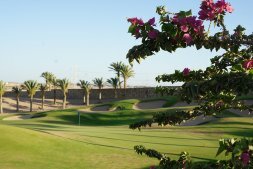 It’s well known that John Sandford created an ‘absolute masterpiece’ from the natural topography of the surrounding desert, a golf course like nothing else in the entire region with a service to match only the finest golf resorts in the world, and we are sure you will agree once you play here, that it’s an absolute ‘hidden gem’ which will drive you to play over and over again. The undulations are firm but fair, vast in quality with 137 strategically placed bunkers to conquer at Egypt’s No1 Golf Course that will certainly test your every golf shot making ability. Fear not, 6 sets of tees allow for the regular sea breeze to assist as well as challenge each and every golfer from the beginner to the professional. Favorite hole - each and every one of them, but 11 and 16 are two absolute beauties that definitely stand out from the rest, due to the colossal elevation changes and panoramic ocean views of the pearlescent Red Sea. With 18 Championship holes, a 9 hole Par 3 executive course and 3 championship length designated training holes, Madinat Makadi Golf Resort is set up for ‘par excellence’, a perfect winter coaching destination for all European markets, and the ideal boutique retreat with our flagship property, The Steigenberger Makadi Golf Hotel. The professional team here welcomes you to test what we believe is ‘Simply the best’.